Rapper Cardi B slays her inner dragons in a tell-all with Harper’s Bazaar magazine. For the publication’s March 2019 issue, the Grammy-nominated star recounts her relentless climb to the top of music charts. Accompanying her rags-to-riches story is a series of apt personifications of the rapper as fairytale characters. 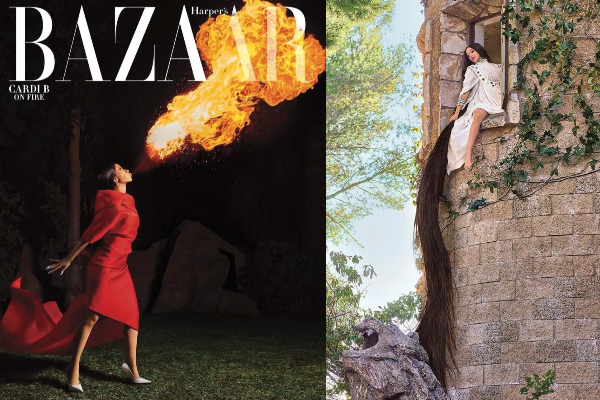 Photographed by Mariano Vivanco, Cardi B is ‘Cinderella’ in a Vera Wang gown, channels ‘Rapunzel’ in a Chloé gown, breathes fire in a Balenciaga dress, and rides a white horse in Dolce & Gabbana. “I feel like my life is a fairy tale and I’m a princess—rags to riches, people trying to sabotage [me],” she reveals. Have a look at the stunning photos of Cardi B as a modern-day princess below.